What if you had a pack that can transform? That’s right, transform. A pack that changes depending on your needs. What if this pack could be a simple, compact fanny pack one minute and when the need arises, it transforms into an ample size daypack to fit all your gear? Well, there’s no need to wonder anymore. ALPS Outdoor Z, being the revolutionaries that they are have made a unique and spectacular pack once again. It’s the Big Bear Hunting Pack. And just as we expected, they’ve pulled no stops in making it the perfect hunting pack. This is for the versatile individual with versatile needs. It’s a fanny pack. But when you need it to be, it becomes a mighty daypack. And in both instances, the functionality is beyond expectation. Yes, the fanny looks a little peculiar, especially when hanging behind your back. But that’s not why you want this pack, is it? You want it to accompany you on your hunting expedition. You want it to hold all your gear without breaking a sweat, and you want it to withstand the punishment that nature is wont to dishing out. So, without further ado, here’s the ALPS OutdoorZ Big Bear Hunting Day Pack Review. The ALPS outdoorz big bear hunting day pack starts out its life as a fanny. It’s a confident-looking pack with handles that rise above it like arms ready to embrace the wearer. The central compartment is large enough to fit your items for the trip. But if that isn’t enough for you, there are two side pockets, sizeable enough to fit smaller gear. Still, there’s a front pocket which is ample enough for even more gear. In this state, it’s large enough for a simple outdoor trip. With a total carrying capacity of 800 cubic inches, you’ll certainly have enough space for the essentials. Perhaps you need more space. The fanny isn’t enough for you and you’re wondering whether to carry another pack. There won’t be any need for that as the Big Bear adjusts itself to fit your needs. Within the Fanny, the daypack is stowed. Simply roll it out and clip it onto the shoulder harness. Just like that, the fanny pack transforms into a mighty daypack. This bumps up the dimensions to 5.4 inches by 11.3 inches by 14.6 inches with a weight of 2.7 pounds when empty. And with an extra carrying capacity of 1900 cubic inches, there’s nothing that you’ll have to leave behind when going on your expedition. Most backpacks are built with numerous pockets but nothing that’s specifically for your accessories. Sure, you could simply stuff them in one of the pockets and be on your way but they run the risk of getting damaged. With the big bear, that need not be a worry of yours. It has an accessory pocket that’s specifically made for your camera, binoculars or calls. These are padded to protect the accessories within, and this allows you to carry them without having to worry about their state. So with the Big Bear pack, not only will you haul the bigger gear, but you’ll also carry the smaller accessories safely. 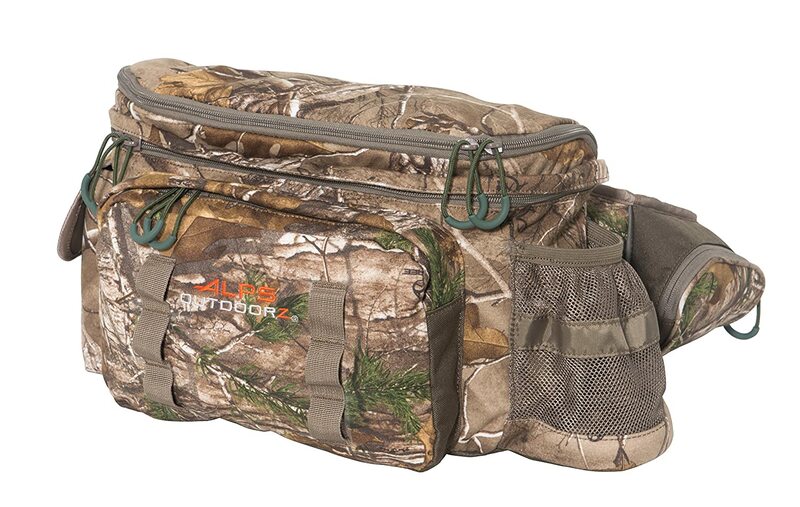 So far, this ALPS OutdoorZ Big Bear hunting day pack is able to carry all your gear. You’ll be filling it to its utmost capacity. But how does it hold up when carrying? Does it pass on the strain to the carrier? First of all, it has an adjustable shoulder harness. This gives it the capacity to fit any torso length comfortable. Adjusting it is easy. Simply pull on the buckle straps. This shoulder harness is also detachable from the whole pack for those times you don’t need it there. Then, the pack also has a padded waist belt. It goes round your waist, comfortable holding the pack in place. The final piece of an ideal pack is the pack’s ability to resist wear from natural forces. You’ll most probably be edging past pushes with the branches and shrubs attempting to tear through the packs build. To counter this, ALPS Outdoor Z built it with their famous Brushed Realtree Xtra HD fabric. This is a highly scratch resistant fabric that defies the vagaries of nature. And it encloses within it the contents of the pack, ensuring everything inside remains safe from damage. Also, the fabric endows the Big Bear with a water resistant quality that can ward off water to a certain extent. Therefore, light showers shouldn’t worry you at all. The Big Bear pack is a fanny pack with a carrying capacity of 800 cubic inches. This pack can transform into a daypack by unrolling the extra sections from within the fanny. The daypack has a carrying capacity of 1900 which gives the whole pack a total capacity of 2700 cubic inches. For easy carrying of your gear, the pack has numerous pockets and compartments. Accessories are carried in the dedicated accessories pockets. The shoulder harness is detachable from the whole pack in case you’re not in need of it. This shoulder harness is adjustable to fit different torso lengths. 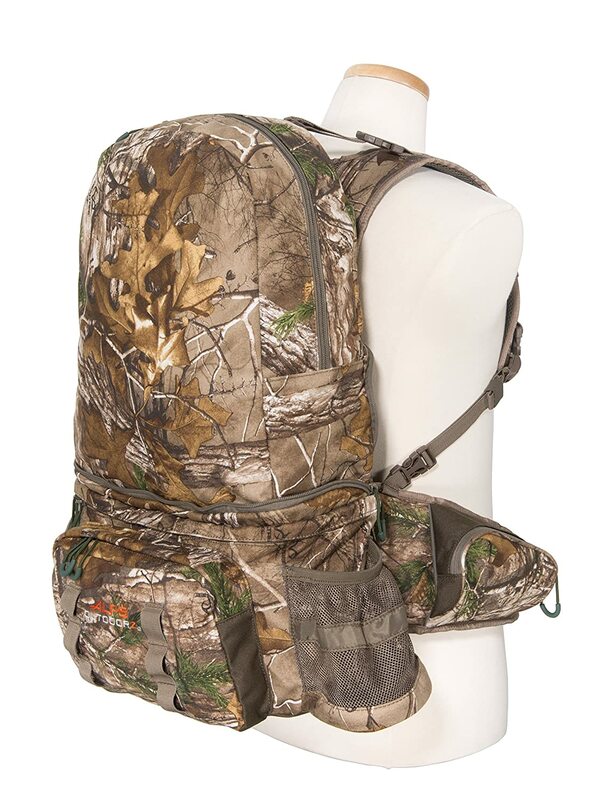 Made of Brushed Realtree Xtra HD fabric, the pack is able to withstand the vagaries of the outdoors. The ALPS OutdoorZ Big Bear day pack has a padded waist belt which enhances comfort while carrying. The pack doesn’t have a frame for ease of carrying. Though the Big Bear is said to be water resistant, it can only resist a light shower. In a heavy downpour, the pack allows water to seep in. Q: Does this pack have a gun carrying pouch? A: No, unfortunately, it doesn’t have that feature. Q: What’s the total capacity of the pack in liters? A: The fanny can carry 13 liters, and the daypack can carry 31 liters. So in total, it’s 44 liters. Q: How many color option do I get with the Big Bear? A: There are the Brushed Realtree and the Brushed Mossy Oak options. Q: What does the pack weigh when empty? A: It weighs about 2.5 pounds. Q: Are there webbing loops for lashing on extra gear? A: Yes, there is an elaborate lashing system on the pack. Nothing is more exciting than a versatile pack that fits your specific need. And it’s great that this pack understands that your needs might change based on the prevailing conditions. The fanny pack is great for carrying a small amount of gear for a simple expedition. If you’ll need a lot of items that can take you are through a day’s trip, then you don’t have to buy another pack. Unroll the backpack from within the precincts of the fanny, and you’ll have enough space for the day’s gear. We also love that the shoulder harness is adjustable and detachable. And so as we end this ALPS OutdoorZ Big Bear Hunting Day Pack Review we concede that this pack is the epitome of versatility and functionality.